If you do nothing else today but pray, you have accomplished a great thing. Jesus said in Luke 18:1, "Men ought always to pray, and not to faint." Throughout the Scriptures prayer is shown to be an essential part of a Christian's lifestyle. It is the way to have power with God. Prayer is the way to God's heart, for He has chosen this to be the way man can communicate with Him. Prayer is a wonderful gift from God to His people. Because of this, many millions of disasters have been averted because He has come to the rescue of His children in answer to their prayers. Captain Johnson was serving as chaplain on an island in the South Pacific during World War II. He prepared to go on a bombing raid on enemy-occupied islands several hundred miles away. The mission was a complete success, but on the homeward course the plane began to lose altitude and the engineers faded out. A safe landing was made on a strange island. It was learned later that the enemy was just one-half mile in each direction, yet the landing had gone undetected. The staff sergeant came to the chaplain and said, "Chaplain, you have been telling us for months that God answers prayer in time of trouble, and that He does it right away. We're out of gas, and the base is several hundred miles away, almost surrounded by the enemy." Johnson began to pray and lay hold of the promises and believed that God would work a miracle. Night came and the chaplain continued his intense prayer. About 2:00 am the sergeant awakened and felt compelled to walk to the water's edge. He discovered a metal float, which had drifted up on the beach with barrels of gas on it. In a few hours the crew reached their home base safely. God is still God and can do anything, and He will work wonders to answer his children's intense prayers! Congo-Regional Missionary Gistophe and his family are on location and have received their resident permits. Already they are seeing people receive the Holy Ghost as they work in this new field. South Africa-In the Eersterust church in Pretoria a woman, the wife of Trinitarian pastor was recently baptized in Jesus Name and she believes her husband will also agree to be baptized. 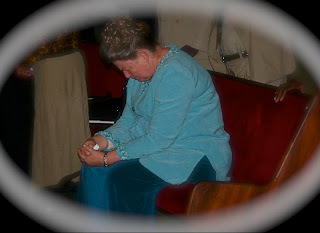 Another lady who was recently baptized was discharged from the hospital after a severe illness. The doctors were not able to diagnosis what was wrong with her. She was unable to walk without assistance. But when she came out of the baptistery she was able to walk unassisted and was dancing unto the Lord. Last month, General Superintendent Jannie Smith was involved in a serious car accident that left him with a crushed right hand. The cast has just come off, but the x-rays indicate that it is not mending as they had hoped. The orthopedic surgeon was satisfied that no other surgeries will be required. He has now started physiotherapy. Thank your prayers for his complete healing. Congo (DRC) - In Kinshasa we have been requesting prayer that we would be given permission to open a campus ministry. We praise the Lord that we now have the permission to do so. Continue to pray for our efforts. Mauritius - 1) Pray for a new place to use as a church in Terre Rough as they are having to vacate their present building, 2) Pray for two of our pastors, Bro. Jacques Dubois for his health and Pastor Vijay who needs prayer for his job situation. Sierra Leone - One of the churches lost their place of worship and is trying to find another location. They are also trying to purchase land for a permanent building.